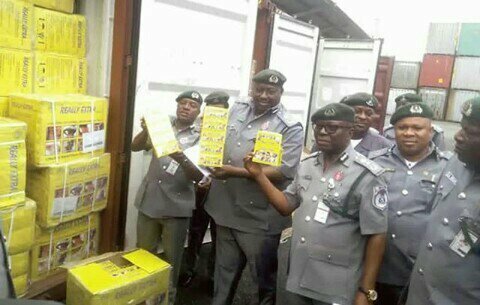 The Nigeria Customs Service, Area II Command in Onne, Rivers State, has confiscated nine 40ft containers loaded with Tramadol. The seizure is coming some days after 50 containers of the drug were intercepted by the security outfit in Lagos. Deputy Comptroller-General of Customs in charge of Enforcement, Investigation and Inspection, Augustine Chidi, told journalists in Onne on Friday that the seized items had a duty paid value of N3,060,000,000. .
Chidi explained that the items were discovered following a diligent profiling of the exporter, a native of India, adding that the containers were falsely declared as containing general merchandise goods and PVC ball valves. . He pointed out that the importation of such prohibited items contravened Section 46 of the Customs and Excise Management Act. “Last week, Nigeria Customs Service announced the seizure of 50 containers in Lagos. This brings the total number of seizures made this month to 59 containers.